RRB Group D Recruitment 2018: ONLINE applications are invited from eligible candidates for Various Posts in Level 1 of 7th CPC Pay Matrix in various units of indian railway. Applications complete in all respect should be submitted ONLINE ONLY before 23.59 hrs of 12.03.2018. Candidates waiting for results of prescribed educational qualification should not apply. 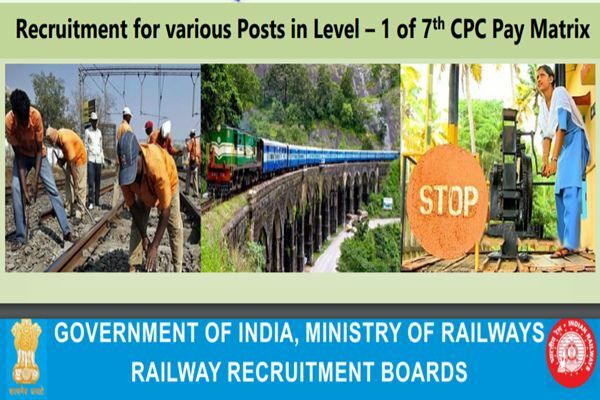 Posts: The posts covered are Track Maintainer Grade IV (Trackman), Gateman, Pointsman, Helpers in Electrical / Engineering / Mechanical / Signal & Telecommunication departments, Porter etc. For complete list and details of posts, refer to detailed CEN published on the websites of RRBs. Computer Based Test (CBT) Tentatively scheduled during April and May, 2018. Vacancies indicated in the CEN are provisional and may increase or decrease in total or in specific Units/communities/posts at a later stage depending upon the actual needs of the Railway Administrations. The Vacancy Table indicating the actual needs of the Railway Administrations. The Vacancy Table indicating the vacancies for UR/SC/ ST/OBC/ExSM and PWD for various posts in various Railways is available in the detailed CEN published on the websites of RRBs. 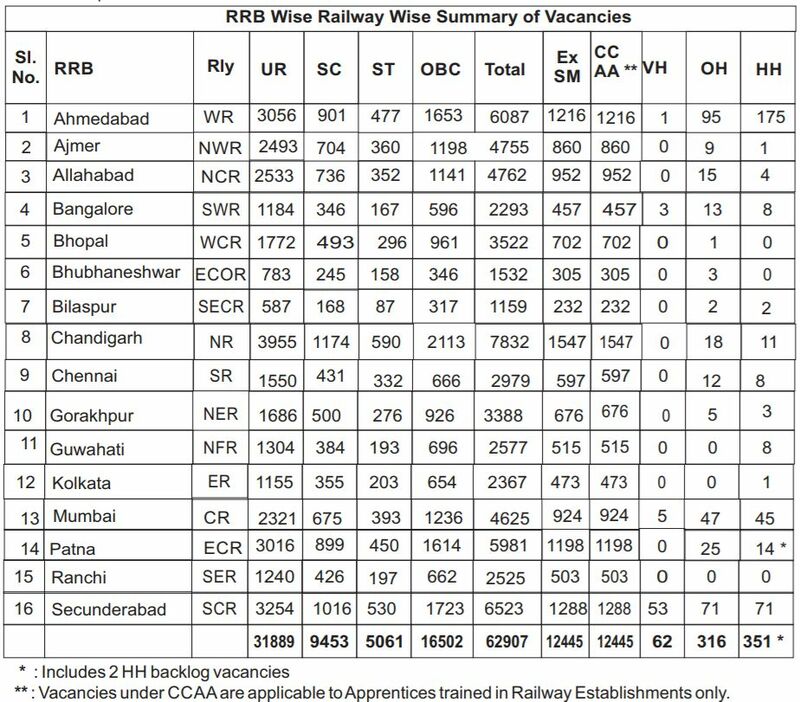 The RRB wise and Railway wise summary of vacancies for various posts is furnished below for immediate reference. Further, the parameters(Qualification, Medical standard and Suitability of the post for PWD etc) of various posts included in the CEN is at Annexure A and the RRB, Railway and post wise vacancy for all the notified posts is at Annexure B.
Relaxations in Upper Age limit shall be permitted to all eligible candidates as indicated in the detailed CEN published on the websites of RRBs indicated at indicated in the detailed CEN published on the websites of RRBs. Pay : Rs. 18000/- (Level 1 of 7th CPC Pay Matrix) plus Allowances as admissible for the posts. 10th pass plus National Apprenticeship Certificate (NAC) granted by NCVT (or) 10th pass plus ITI from institutions recognised by NCVT / SCVT. Those awaiting results of the final examination of the prescribed educational/technical qualification SHOULD NOT apply. Diploma/Degree in Engineering will not be accepted in lieu of course completed Act Apprenticeship / ITI. Also, Graduate Act Apprentice will not be accepted in lieu of Course Completed Act Apprenticeship. Candidates must ensure that they fulfill the prescribed medical standards for the post(s) they are opting for. Refer to the medical standards for each post as available In the detailed CEN published on the websites of RRBs. Candidate found medically unsuitable for the opted post(s), shall not be given any alternative appointment. Suitability for PWD: For details on the suitability of various posts for PWD, refer to the detailed CEN published on the websites of RRBs. refer to the detailed CEN published on the websites of RRBs. Candidates are advised to refer only to the official websites of RRBs as mentioned below for detailed CEN 02/2018 and submission of online application. Only single online application has to be submitted by the candidate to the RRB of their choice for all the notified posts of that RRB through the link provided on the official website. The entire recruitment process shall involve a Computer Based Test(CBT), Physical Efficiency Test (PET) and Document Verification. All the eligible candidates have to undergo a Computer Based Test on the specified date, time and venue as per the e-call letter to be downloaded by the candidates from the websites of RRBs. The information about the e-call letter download shall be communicated through the websites as well as personal email communication to the candidates. Candidates can apply for vacancies of any one RRB only through ONLINE application mode by visiting the official website of RRBs listed above. a) Read all the Information and Instructions detailed in the CEN thoroughly before starting the filling up of application by clicking the CEN 2/2018 Link on the RRB website. It is essential that the candidate understands all information of the notification correctly to prevent any mistakes while filling application. b) Scanned documents JPEG format to be kept ready before filling the application In order to ensure speedy filling up of application by the candidates, they should keep the following documents ready in digital form before logging in to the application page. c) Check RRB Wise Vacancies for the qualification and Reservation Category of the candidate: The candidates are advised to check the Vacancy Table in this CEN to ascertain the vacancies notified against all RRBs for their qualification and ensure that the RRB to which they wish to fill in the online application is having vacancy for their qualification and community/category subject to eligibility in terms of age and medical standards. After completing the process above, click on the “New Registration” link on the home page of the Online Registration portal of CEN 2/2018 for the recruitment of various posts in Level 1 of 7th CPC Pay matrix.